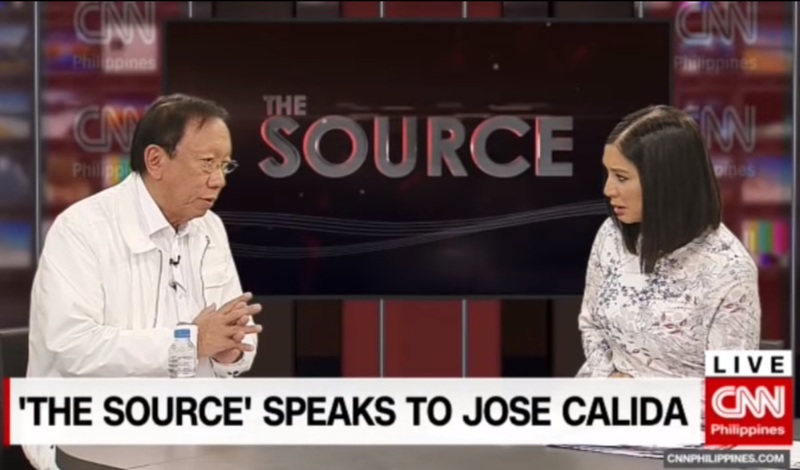 Solicitor General Jose Calida was welcomed onto CNN Philippines' The Source Thursday in what has been his only television interview since the controversy involving him and his family-owned security firm broke out. Speaking to Pinky Webb, Calida insisted that there's no conflict of interest with his family's Vigilant Investigative and Security Agency Inc. bagging contracts with various government agencies as rules, according to him, have been followed during the biddings. "We don't always win when we join government procurement biddings. In fact, since I assumed my office, we lost 3 biddings. One is the Philippine Sports Commission, the PAGCOR-Malate, and another bidding for the Philippine Sports Commission. And that's the reality, you don't win always," he said. Calida also said that the amount that has been put out there — P150.82 million — is not entirely accurate "because that is the approved budget for the contract." Responding to calls for his resignation made by Senators Risa Hontiveros and Kiko Pangilinan, Calida said there's no reason for him to step down from his post as he "didn't commit graft or corruption." "I understand where she's coming from. They are angry with me because I won the quo warranto case and ousted their poster chief justice. Had I lost the case, they wouldn't have attacked me like this. Now, I understand also where Senator Pangilinan is coming from. He is the president of the Liberal Party," he said. Asked to respond to the complaint filed against him by Jocelyn Marie Acosta-Nisperos, a Sereno supporter, at the Office of the Ombudsman, Calida said it's just a political attack against him and President Rodrigo Duterte. "This woman admits that she has no evidence. He who alleges must prove it. And what she is saying is actually a vicious, malicious concoction. They are fabricating charges against me, they want to destroy my family and I will not forgive them for that. There will be a day of reckoning," he said.